Blue, Kia Sedona, runs great and has great mileage for a 2004. I am very pleased with this vehicle. I recently purchased this van, used obviously, I had a Sedona years ago, it runs well, good engine pickup, overall quiet ride, the only thing I don't like about this van is the fact that it does not have a remote key fob. It had one but over time it was lost by a previous owner, we could get it replaced but just have never gotten around to it, might not ever do it, not a real problem. Hope this van lasts for many more years for me. 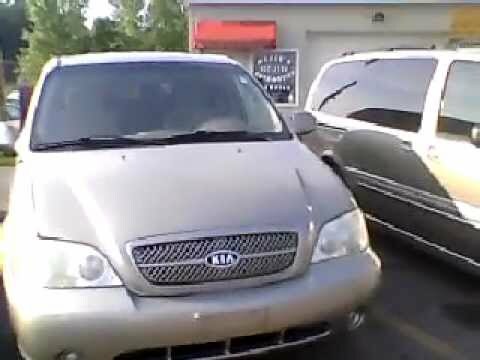 2004 Kia Sedona. It has the smoothest ride of any car that I have ever owned. I bought this van new and have put every mile that is on it myself. Which by the way is a little over 62k. I haven't have to do a lot problems with the van at all. I have replaced the battery once. I have had to replace a warped rotor. Of course the required tune up. And a belt tension adjuster. I consider these repairs are minor the age of the van. Luxury at an affordable rate. I love my Kia Sedona. It has ran very efficiently until recently. It has started causing a lot of problems with sensors and general maintenance. however it has lasted me many years without any problems. It fits my family size perfectly. I would definitely recommend this make and model to anyone. It's very affordable but still at a high standard. Kia Sedona review - What Car? ON CERTAIN MINI VANS, FREEZING CONDITIONS CAN CAUSE WATER ON THE THROTTLE CABLE TO FREEZE DURING NORMAL OPERATION. RESISTANCE TO MOVEMENT OF THE THROTTLE CABLE CAN OCCUR WHEN THE DRIVER LIFTS THEIR FOOT OFF OF THE GAS PEDAL. THIS CAN CAUSE THE CABLE TO HAND UP, THUS ALLOWING THE VEHICLE TO MAINTAIN SPEED OR ACCELERATE. SUCH AN EVENT CAN OCCUR WITHOUT WARNING AND COULD CAUSE A CRASH. DEALERS WILL MODIFY A PROTECTIVE SLEEVE AROUND THE THROTTLE CABLE. THE RECALL IS EXPECTED TO BEGIN DURING SEPTEMBER 2005. OWNERS SHOULD CONTACT KIA AT 1-800-333-4542.